ENGINE: Universally acknowledged as the modern benchmark for in-line 3 cylinder power units, the MV Agusta engine requires no introduction: it is pure Italian technology at its best, energy that continues to evolve. In fact, MV Agusta has taken an already exemplary bike and fine tuned it even further. Like every RR, the Dragster just “has to” offer something more. Hence the most powerful engine in its category. Developed from the 3- cylinder engine that powers the Brutale 800 and Brutale Dragster 800, this most recent 3-cylinder version unleashes 140 hp and puts out Superbike- like revs (maximum power is achieved at 13,100 rpm), making the Brutale 800 Dragster RR not just uniquely eye-catching but also placing it beyond the reach of its competitors in the same segment. Don't waste your time looking: the only place you'll find another equally powerful 3-cylinder 800 engine is on another MV Agusta, the F3 800. To build an engine as light and compact as possible. To combine racing performance with outstanding rideability. These were the goals that MV developers set for themselves when they designed the 3-cylinder engine range: goals that the Brutale 800 Dragster RR engine achieves admirably. 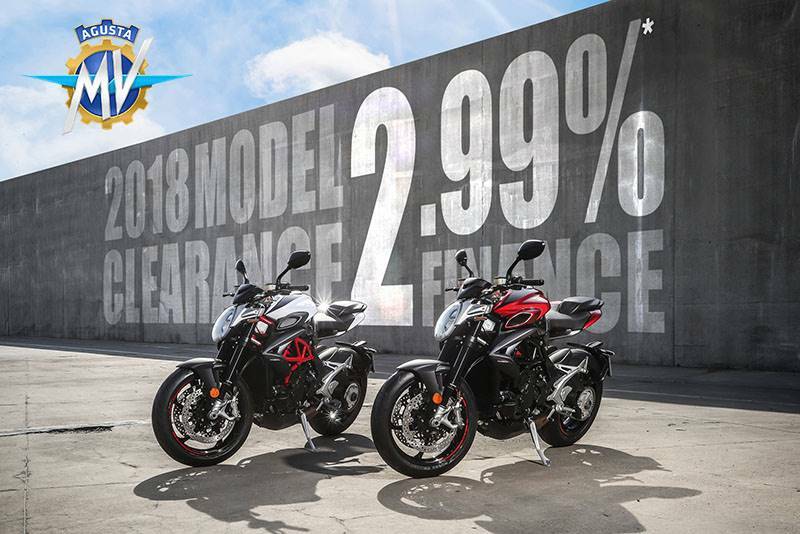 Weighing in at just 52 kg and being extremely compact despite the displacement, the in-line 3-cylinder engine optimises weight distribution while the counterrotating crankshaft - a solution never before adopted on standard production models - enhances the dynamic performance of the Brutale 800 Dragster RR. These are characteristics that make this engine the best example of Italian engineering excellence and one of the most advanced triples in the world. The constant quest for perfection in every detail has led to the development of a new hydraulic chain tensioner, which makes the engine both quieter and more reliable. For an engine that is not an F3 800 offshoot but the evolution of the 3-cylinder unit mounted on the Dragster, the configuration on the Brutale 800 Dragster RR is the most powerful ever to go into production. The 140 hp at 13,100 rpm are achieved in part because of the fully redesigned airbox and an optimised, more efficient exhaust system. Changes have also been made to the electronic injection, which has an advanced sixinjector system (two per cylinder, instead of the single injector used on other Brutale models): a reshaped fuel tank interior provides the necessary space and keeps everything hidden from view. The resulting power delivery is linear at low revs and explosive at high revs, giving the three-cylinder engine eye-watering acceleration, which ends only at 13,200 rpm when the rev limiter kicks in. Power is not the only thing to have been given a considerable boost: torque has also been raised, from 81 to 86 Nm. 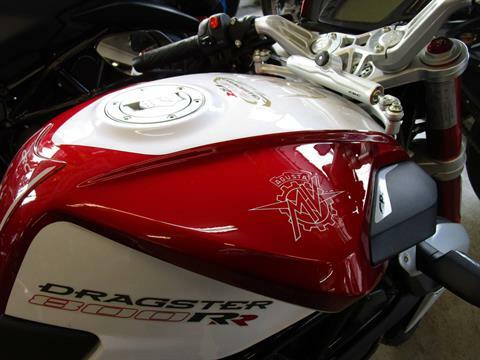 Figures like that clearly illustrate the impressive individuality of this revamped MV Agusta 3-cylinder engine. The removable 6-speed gearbox was naturally maintained - another solution taken from the racing world - with gearing specially designed to provide staggering on-road acceleration and outstanding versatility even on the racetrack. ELECTRONICS: Further improvements are provided by the second-generation MVICS (Motor & Vehicle Integrated Control System) electronics platform. Characterised by ever-more effective and accurate mappings, it combines the explosive power of the 3-cylinder 800 with fuel-saving high efficiency. Clear evidence then, of how the pursuit for performance has not overshadowed the quest for eco-friendliness or low operating costs. Central to MVICS performance are the Eldor EM2.0 engine control unit and a Mikuni Full Ride-By-Wire throttle body. As on other 3-cylinder MV Agusta models, the system lets the rider configure torque control on four mappings: three of them provide a pre-set combination of parameters (Sport, Normal and Rain); the Custom mode can be set by the rider, who can adjust parameters such as engine response, rev limiter, engine torque response, throttle sensitivity and engine braking. Of course, the Brutale 800 Dragster RR would not be complete without 8-level traction control, which can be disengaged and comes with model-specific mappings. To handle all this extraordinary performance riders can now rely on the new Quickshifter EAS 2.0, which allows ultra-fast clutchless upchanging and downchanging. In fact, for bikes in this category the introduction of an electronic downshift control system is an absolute innovation. 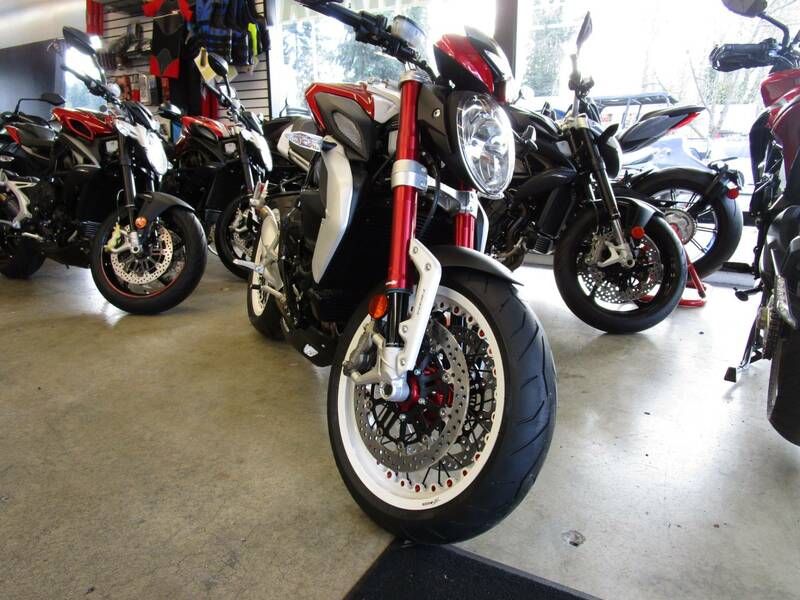 Downchanging is made even easier by the new slipper clutch, which improves bike control going into bends. This is a key advantage not just on the track but also on the road. CHASSIS SET-UP: The Brutale 800 Dragster RR measurements are the same as those that made the Brutale 800 Dragster the benchmark for naked sport bikes. The wheelbase is 1,380 mm, with 95 mm of offset on the fork yokes. 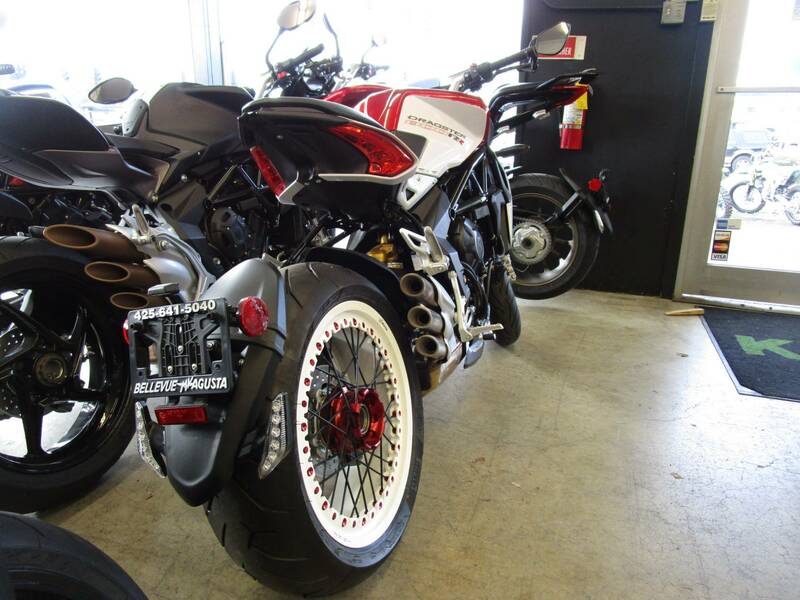 Tyre crosssections also remain unchanged, with the eye-catching Pirelli Diablo Rosso II 200/50 at the rear. The chassis structure employs a solution shared by on all the latest-generation MV Agusta bikes: an ALS steel tube trellis frame with integrated light aluminium profiles in the rear zone which acts as the pivot for the swingarm. This design choice, in addition to making MV models even more unique and immediately recognisable, effectively meets the dual needs of providing adequate torsional stiffness and keeping overall vehicle weight as low as possible. The suspension uses equally advanced and smoothly integrated components: more specifically, the bike now features a CRC steering damper that can be adjusted to adapt performance to the road, the track or, of course, rider preferences. The Marzocchi fork features upside down aluminium stanchions (43 mm diameter), now lighter and even more attractive thanks to the red anodizing; moreover, DLC (Diamond Like Carbon) coating enhances smoothness and maximises component strength. The 125 mm of travel is the same as that on the adjustable Sachs shock absorber attached to the swingarm. The seat (811 mm high) and pegs offer the same widely acclaimed ergonomics found on the Dragster 800, along with specially customised heel guards. Incredible stopping power is provided by the all-Brembo braking system, which has a pair of floating front discs (diameter 320 mm) equipped with 4-piston callipers and a rear 220 mm disc with a 2-piston calliper. The ABS system rounds out the package, ensuring safety and performance even on slippery or wet surfaces. 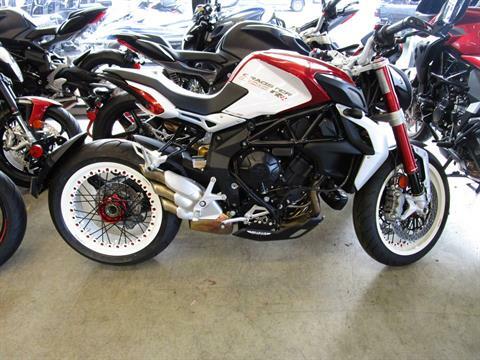 New features include the stunning spoked wheels, which immediately distinguish the Brutale 800 Dragster RR from any other model: skilled use of anodizing, perfect assembly by hand, a great color scheme - with black or white rims - make this component the focal point of the beefy yet classy coolness that this new MV Agusta exudes. Dedicated graphics and a flawless finish - as highlighted by the multiple layers of paint usually reserved for high end vehicles in the car industry - further emphasise the uniqueness of the Brutale 800 Dragster RR. Brute force. Panache. Charisma. Front - With aluminium alloy spokes 3.50 x 17 in. Rear - With aluminium alloy spokes 6.00 x 17 in.